The Westpoint Regatta proudly supports the fight against oceanic plastic pollution led by The Ocean Cleanup . Find out more about plans to initiate the largest cleanup in history at TheOceanCleanup.com. Their passive system may be a feasible and cost-effective method to remove half the Great Pacific Garbage Patch in 10 years’ time. Please visit their website to learn more about their efforts. It's simple: do not buy single-use plastics or styrofoam. Sure, we recycle what we can but after it hits the recycle bin, trying to make some use of it is extremely difficult and often causes more pollution to re-purpose the item into something else. The best way to solve a problem is not to create the problem in the first place - do not buy single-use plastics or styrofoam. 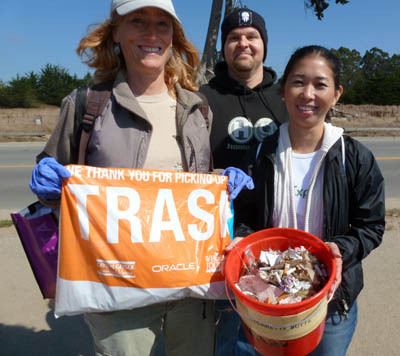 When Sequoia YC started their Coastal Cleanup event, some said "I don't see any trash near the club. Not sure how much you will find." Boy, we have we learned a lot. Every year, the volunteers at Sequoia YC collect hundreds and hundreds of plastic trash from just the waterfront around the club. Of the state-wide cleanup sites reporting from the 66,292 volunteers, they picked up 1,030,571pounds of trash and an additional 98,761pounds of recyclable materials,for a total of 1,129,332 pounds or 564.7tons. Try to find and buy products without plastic packaging. Pick up trash where you see it. Encourage your club, organizations and workplaces to omit single-use plastics and styrofoams.